Reading African-American science fiction writer Octavia E. Butler’s Parable of the Sower instilled in Ashley Chavez an understanding that “anyone and everyone” can make a change, she said. As a St. Catherine University student leader participating in the university’s year-long integrated learning experience centered around Butler’s work, Chavez is among a host of students, faculty, staff, alumni and community members engaging in conversations related to the book’s themes of hope and change, transformative leadership, immigration, religion and more. Butler’s Parable follows the protagonist Lauren Olamina as she navigates a dystopian future shaped by climate change, resource insufficiency and wealth inequality. Conversations throughout the campus have been “very powerful” so far, Stanley said, adding that the novel has provided a “common language” to approach issues that the campus and community are dealing with. 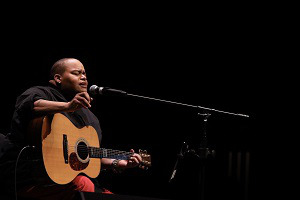 The integrated learning series at St. Kate has included book discussions, online learning presentations, and the Bonnie Jean and Joan Kelly Distinguished Scholar Lecture featuring a keynote by singer, composer, musician and producer Toshi Reagon. Reagon will soon return to campus with “Octavia E. Butler’s Parable of the Sower: The Concert Version” on April 26. Zaynab Abdi, a third year honors student triple majoring in political science, international relations and philosophy, said while reading Parable, she questioned if the future would mirror the novel, as much of the text relates to our lives today. “It was amazing and depressing at the same time,” she said of her reading experience. However, she found it interesting to explore the book’s themes and play on leadership, especially because Lauren was a younger person who had the power to make a change, Abdi said. Ashley Chavez, a public health major with concentrations in public policy and community health, similarly said she has grasped how Butler’s work has operated in other people’s lives just through reading Parable and listening to Toshi Reagon’s keynote. While reading, Chavez said she views the text through the lens of a public health student and wonders what she would have done if she were Lauren, the book’s protagonist. “There’s a lot of hope in the book that there can be change by anyone and everyone,” Chavez added, noting that she sees the novel as what our world looks like today. As External Affairs Senator on the Student Senate and team lead on the University Events crew, she hopes students feel a sense of belonging on campus as they immerse themselves in Butler’s book. 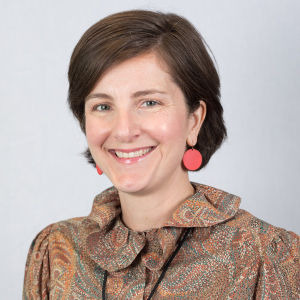 As for faculty, Dr. Amy Hamlin, associate professor of Art History at St. Catherine University, said conversations in small gatherings – particularly around Parable’s themes of immigration and privilege – have catalyzed conversations about curriculum reform at St. Kate’s. Hamlin said that, since starting the integrated learning series, she has noticed more willingness to be present and listen better. Reflecting on St. Kate’s mission to educate women to lead with influence, Hamlin said conversations with Dr. Stanley, student leaders like Abdi and Chavez and others, have gotten people thinking about how Lauren embodies the institution’s mission in ways that “encourage us all to think better and more equitably of what transformative leadership can look like – and who can be a leader,” she said. St. Kate leaders hope that students – regardless of their area of study – find connections to themes and activism in the novel that they can then be empowered to use in their careers and day-to-day lives, Hamlin said. 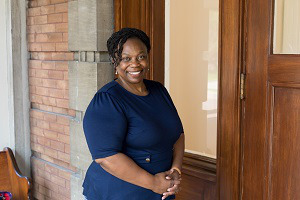 In addition, Stanley hopes people recognize the community building woven into much of Butler’s works and that they see Parable as an “entrée” to connect more directly with the campus itself, she said.